In ‘Egyptian Melodies’ the little six-legged spider from ‘Midnight in a Toy Shop‘ (1930) returns to the animated screen. The short is one of those early Silly Symphonies that offers quite a dull dance routine only (and no story). Nevertheless, the introduction of the cartoon is well worth watching: when we follow the spider down into the pyramid, we experience some astonishing 3D-effect animation, creating the feeling that the camera wanders with the spider through corridors and staircases. This unique exercise in perspective would not be repeated in animation until labyrinth computer games were introduced in the 1980s. The Disney Studio itself must have been impressed by this stunning piece of animation, for it was reused two years later in the Mickey Mouse cartoon ‘The Mad Doctor‘ (1933). Once inside the pyramid, the spider watches four mummies dance, and the drawings on the walls coming to life. These last scenes feature 2-dimensional characters, which can be seen as very early and primitive forerunners of the cartoon modern style of the 1950s. Unfortunately, these scenes are a little bit dull, but they do lead to a great finale. This is one of the earliest nightmare-sequences, in which the montage of images is diffuse and increasingly sped up, in order to suggest the feeling of getting insane. This predates similar sequences in films like ‘Der Fuehrer’s Face‘ (1943) by many years. 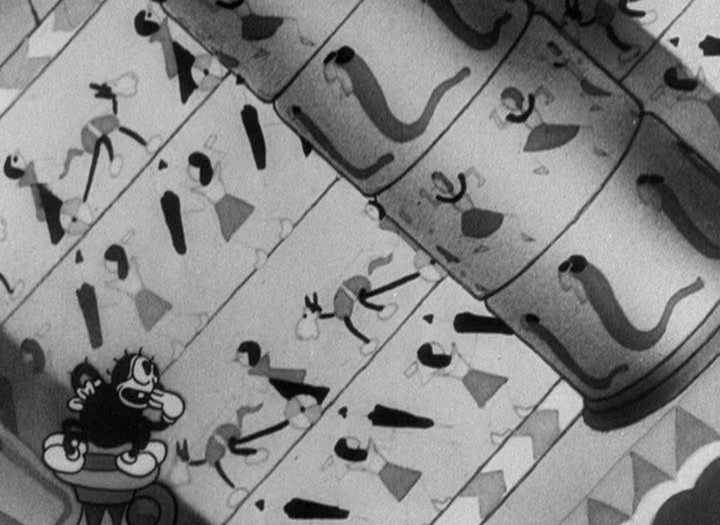 The idea for ‘Egyptian Melodies’ may have come from the Van Beuren cartoon ‘Gypped in Egypt‘ (1930), which also features dancing hieroglyphs, nightmarish scenes, and even a corridor scene. Notice that the classic horror film ‘The mummy’ (1932) hadn’t been released, yet, at the time.